January 23rd, 2009 - Yesterday, I went for a spin north on the motorbike to Gunung Batur. This is one of the numerous volcanoes on the island. Although I do plan to climb it at some point this was more of a scouting mission. I just felt like riding. On the way a local woman stopped me at an intersection in order to bequeath the requisite blessing and extort the requisite 10,000 rupiah. Afterwards, a gentleman on the side of the road informed me that I got screwed. Normally, blessings run 1,000 rupiah. Maybe I needed the more potent version. After all, my soul is ablaze with countless indiscretions. 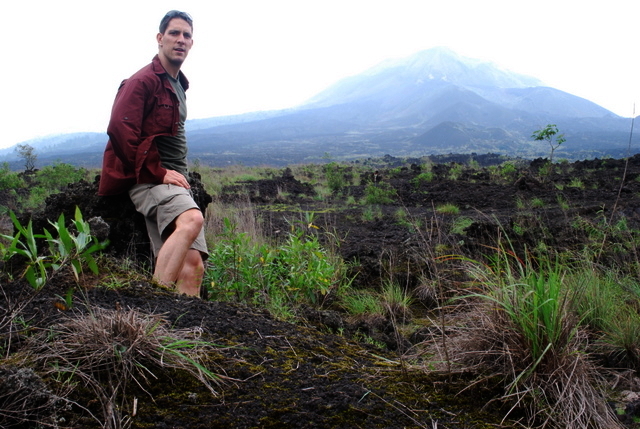 It is the wet season which means of course that the tip of the volcano is frequently obscured. I did get a picture but it is not so crisp. You will also see the one of me on my hog. Born to ride. Born to raise hell (hence the necessity for the deluxe blessing). I took a detour on occasion down roads that few tourist appear to venture and received the well-recognized ‘What-the-hell-are-you-doing-around-here?’ glances. Some rather cute little girls beguiled me out of a few rupiahs. Diabolical. It was worth it as one of them graciously allowed me to snap a photo. Generally speaking, it is a terrible idea to hand out cash to anyone as it sets a bad precedent but they melted me like butter. I handed over less than a dollar but they were extremely appreciative. What can you do? The whole area around the volcano is covered in lava rock. There have been numerous eruptions over the years, although I believe it has been some time since a major one.